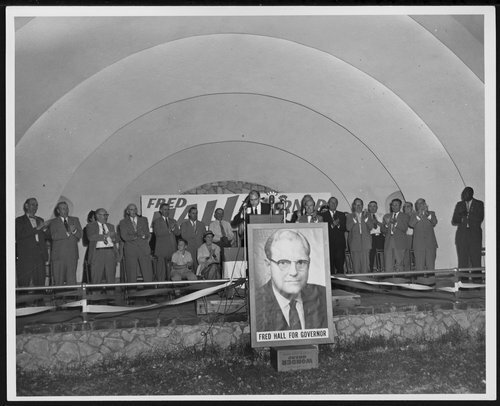 This black and white photograph shows Kansas Lieutenant Governor Fred Lee Hall (1916-1970), campaigning for governor in Dodge City, Kansas. Hall's platform was calling for reform to clean up Topeka, Kansas, similarly to President Eisenhower's efforts to clean up Washington, D. C. In the November general election he defeated his Democratic challenger George Docking to become the thirty-third governor of Kansas, serving from 1955 to 1957. Hall served one term as governor and was unsuccessful in his attempt for a second term. He resigned in the final days of his administration on January 11, 1957 accepting the appointment as justice of the Kansas Supreme Court from 1957 to 1958 before stepping down to run for the governor's office again. After being unsuccessful, he retired from his political career.